Great sporting performance is often linked to great lighting performance. Skill, dedication, sacrifice and training are all important aspects, but providing the perfect stage is also key to helping athletes turn their pursuit of greatness into sporting success – at all levels. With this idea in mind, Thorn has delivered a comprehensive new lighting system for a multipurpose sports arena in the Italian city of Trento. 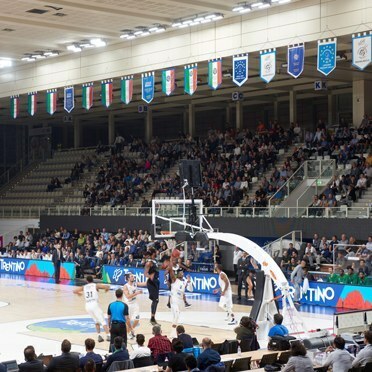 Innovative LED floodlights provide the perfect conditions for a range of matches and sporting events, helping the local sports teams enjoy both home advantage and the best possible lighting when they entertain visitors to the PalaTrento arena. 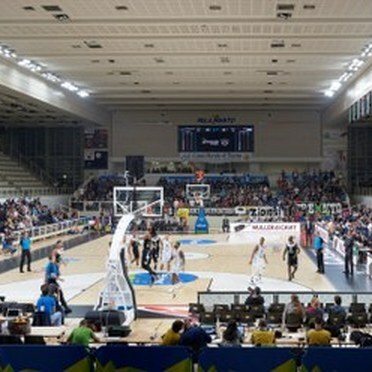 The local authorities in Trento, a city in the northern part of the country with top-level volleyball and basketball teams, were inspired by the opportunities offered by new sports lighting when they took the decision to renovate sections of the PalaTrento arena. They opted to concentrate resources on the key elements that shape the experience of supporters and influence the performance of the sportsmen and sportswomen taking part – which is where effective and efficient lighting can play a major role. The 4360-seater arena will soon be expanded to accommodate 5000 people, but the first round of renovations has concentrated on the installation of new flooring, refurbished seating and – crucially – a modern lighting system. 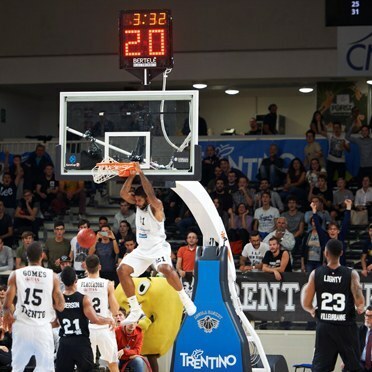 Aquila Basket Trento, who last year reached the Serie A championship final, and Trentino Volley, a team that has claimed four volleyball League A championships, three Champion cups and four Club World titles in the last ten years, have already experienced the special new sporting surroundings of the PalaTrento. The task of modernising the lighting solution was entrusted to Thorn, who could call on a comprehensive product portfolio to renovate an ageing system that was no longer compliant with the latest league standards and unsuitable for HDTV broadcasting. The new lighting system has helped the venue fulfil the regulations and achieve significant energy savings, while at the same time establishing the PalaTrento venue as a top-class sports facility for both daily training sessions and competitive championship matches. 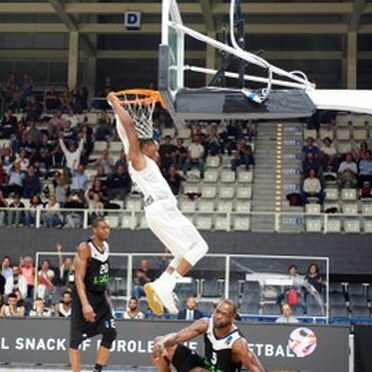 The impressive results have even prompted comparisons with the NBA. 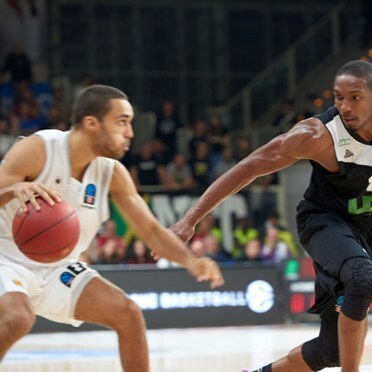 The music, colour and lighting effects that mark the start of games in North America`s world-famous basketball league have become the stuff of legend. Yet now there is no need to cross the Atlantic to see that kind of show – just take a trip to Trento! Thorn worked closely with LCP partner Teknoengineering to plan and realise this impressive renovation project. After very careful consideration the lighting team decided to use the Thorn Altis Sport fitting, a high-power LED floodlight for sports applications. Altis Sport provides exceptional flicker-free lighting and is therefore suitable for HDTV broadcasting. The flexible optical system delivers an optimised lighting distribution, which is a key factor in giving players the perfect environment in which to show their sporting excellence. The 92 symmetrical and asymmetrical floodlights can achieve lighting levels of up to 3400 lux, while the full individual control offered by the DMX system enables dimming and directional positioning. The new lighting solution comfortably outperforms the large number of conventional discharge lamps that made up the old installation. Indeed, different luminaire sizes and varying lighting intensities meant that the previous system was unable to guarantee the achievement of the regulatory standards required for high-level international competitions. Thankfully supporters and players alike now see everything at the PalaTrento arena in a very different light!